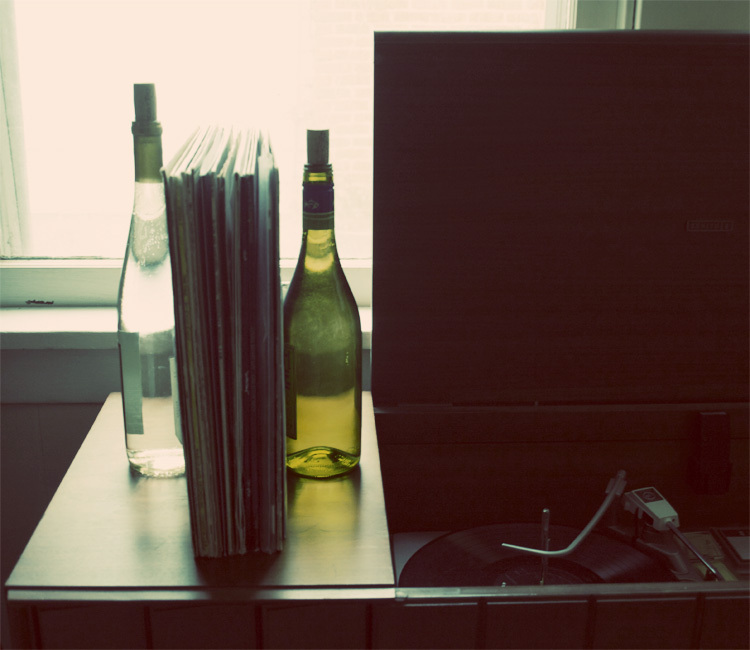 White Wine and I have a little thing going on right now. For years I have avoided it because I thought it was responsible for some very bad headaches. Recently I discovered I can enjoy a glass without consequence, so I have. I’ve enjoyed many. Now I’m left with a bunch of pretty glass bottles that I’d prefer to use in some way rather than recycle. Alternative uses for your wine bottles! The quick and easy diy guide. 1. Wine Bottle Rolling Pin. I used one to make this. 2. Wine Bottle Vase. Plain and simple. 3. Wine Bottle Fruit Fly Trap. My friend Shawn taught me this trick a couple of summers ago. All you have to do is leave about an inch of wine in the bottom, or alternatively use apple cider vinegar. The little suckers will fly in, and drown. 4. 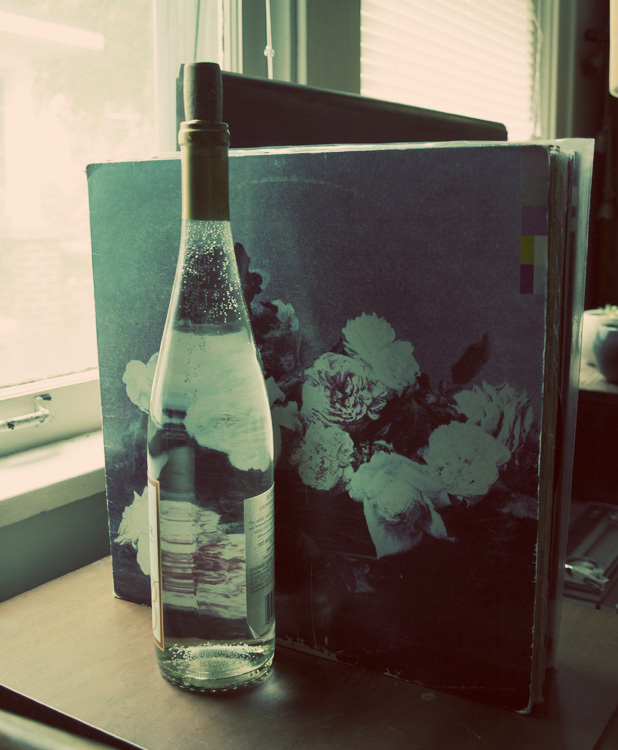 Wine Bottle Album (or book) Ends. 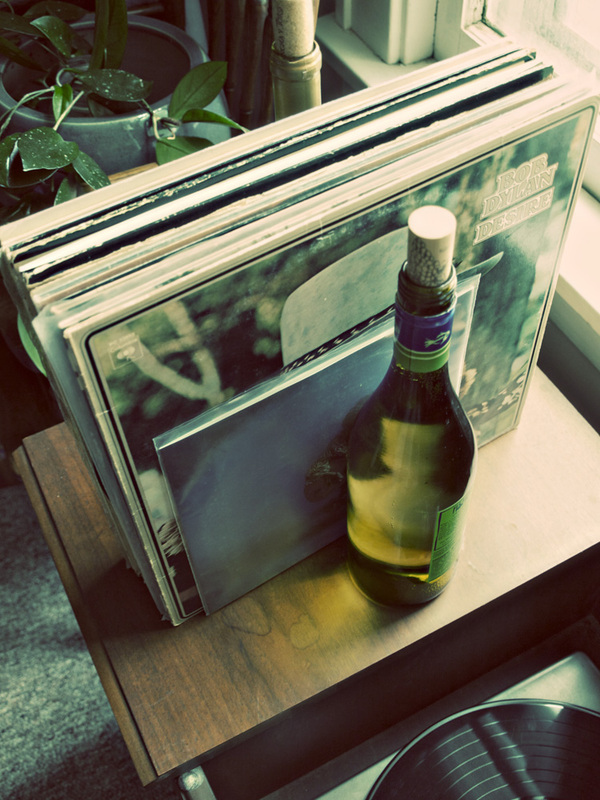 Fill a couple of bottles with sand (or water), re-cork and stick vinyl albums or books in between. Use empty bottles to store rice, beans, pasta, and whatever else that will fit. You will likely have to invest in unused corks for this. 6. Wine Bottle Window Art. Line your window sill with a row of bottles, empty or filled. If you’ve got mainly clear bottles you could fill with water and add food coloring for some added pizzaz. 7. Wine Bottle Beverage Container. If you happen to make your own wine, why not reuse your bottles? Also you could serve other beverages from the bottles when entertaining. There you have it! If you happen to have anymore suggestions, I’d love to know. Very cute! Love the ideas. Thanks. The best part of wine bottle recycling is the act of getting there, buzz and all. I prefer full bodied reds. For christmas, my dad gave me a wine bottle with string lights and a straw like material on the inside. When I plug it in, I have a wine bottle lamp of sorts. The vase is a really neat idea. I saw this ad the other day but haven’t tried it yet. Not sure how good it tastes. Thank you! I honestly didn’t even know I had made FP until I read your comment! I I came home from work and figured I’d work on a new post and was really confused as to why I had so many pending comments. I thought a spammer must have attacked my site haha. So thank you for letting me know :) I’m new to the WordPress community (my blog is still a baby at 10 days old) but this has been such an honor! I really appreciate everyone’s support. Also, that’s great to know about home made wine. I’ve always wanted to make my own. I love your ideas! I’m a great lover of wine as well and some of the bottles I’ve collected I find too beautiful to recycle. Thank you for the list! I’ve actually used various sized wine bottles as candle holders. It adds an element of charm when hosting a dinner party. The only problem I had was getting the candles to fit, which I solved by trimming the bottom down with a knife, then melting the wax to seal it. This kept the candles from falling out and causing a fire. I have wine bottles lining the shelves in my kitchen. They are beautiful, and each one tells a story — a memory of where and when and how I consumed it. I like the window art and vase ideas best. I’ve seen wine bottles used as dish soap dispensers. You put a shot pourer on the top instead of a cork and use it to dispense your soap. The rolling pin is awesome! If you bake, fill the bottle with cold water and it’s ideal for rolling out pastry. True story. I wish I would have known that when I was rolling out the dough for my pizza! It required a lot of muscle, I’ll say that. I imagine the water helps a lot. Thanks! We have this habit of saving all our corks and making cork-boards out of them! Just stick the corks with glue onto a flat piece of a thin wood board or something like that, you can put them in nice patterns or just in rows – they tessellate pretty well, then you can use it as a cork-board/pin board in your office or bedroom or whatever. Really good when you’re a student! http://rodas-recipes.blogspot.com……they are so super easy and taste divine. I do love me some recipes. I’ll check them out! this is beautiful! i’m glad i came across this…very inspirational. Thank you! I’ve been kind of shy about showing it off in the past… so much for that haha. I love it! I happen to love wine bottles myself, but my father doesn’t believe in having them around the house, so we recycle. But there are some very unique ones that are just lovely. If I didn’t collect so many other things, I might keep the cool bottles, but for now, I’ll just dream of it. thanks so much! hope you can try them out. Really interesting. I had been trying to come up w/ some decorative ideas for some of my more uniquely shaped liquor bottles. Thanks. Used the rolling pin idea already! And the vase! Cute though. Lovely pictures. Have you tried filling with water and making music? I read that you can cut glass under water with a scissors – but haven’t had the nerve to try it…looking forward to next blog on the subject. What an amazing group! So honored to be included :) cheers! Hello, LOVE THESE IDEAS, I happen to have a collection of wine bottles —- LOVE, LOVE, LOVE the idea of lining the window! Thank you! I ran out of room for the bottles, so I started collecting the labels. You need to be careful, so you don’t burn yourself, and steam them off. I did up a wooden serving tray full of them, overlapping the labels to hide any edges that didn’t peel off well. I used “mod podge” to make them restick and seal them, but I’m sure other products would work too. The labels would also make beautiful scrapbook pages, another way to gather a collection of wonderful memories. Could try that i suppose, but i dont drink. I like the idea about using wine bottles for other beverages. I live in the deep south, so I must always have sweet tea to offer any and everyone. The idea of offering people sweet tea then grabbing a wine bottle from the fridge and pouring them a glass is too tempting to resist. thank you! 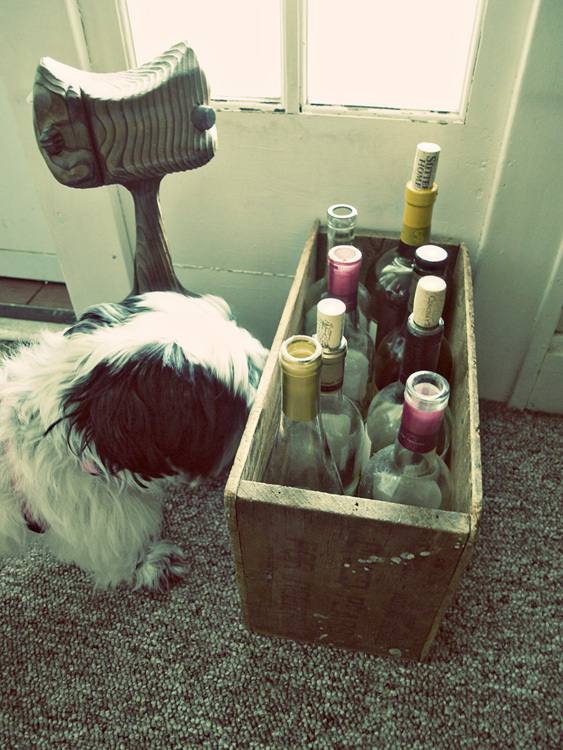 she’s a cutie :) sweet tea from wine bottles sounds divine. Love the simplistic style of your blog and the beautiful photos. We have a collection of beer bottles that I’ve been recycling in different ways. I posted some on my Cheers Beers blog if you’re interested – http://cheersbeers.wordpress.com/2011/05/08/new-life-for-old-beer-bottles/ I’ve also been melting them down in my kiln to make cheese plates and spoon rests. Am always looking for new ideas so thanks for posting this! we made tea candle holders out of beer cans when I was in Indian Princesses long ago. Had mine until it looked too shabby to keep…fun to do with kids, although maybe3 pop can would be a better choice! Nice pictures, good luck brainstorming, going good, real smooth. Congrats on being freshly pressed. I love the ideas, especially for the book ends and the simplicity of the bud vase. Very nice, enjoyed your blog! Brilliant! I have several wine bottles that have just been sitting in the wine rack waiting to be replaced by full bottles. Love these ideas! Especially the rolling (pin which I have wanted) and the fruti fly trap (hate those things). :D Thanks for sharing! I re-use mine also, some same as yours and also I have one of those metal candle holders that pops into the opening and holds 3 voltives(Love that one) I use some for olive oil and stick in a spout pourer.Congrats for being on FP. I just saw the metal votives for the first time, very neat! Do you know if I could find one at an arts & crafts store? I’d really like to make one. Thanks!! Musical Instruments. LOL it’s true . . fill different levels of water into them. Then blow over the top for different tones. Playing speedy riffs will take some practice though! My cousin received a wedding gift from her wine-enthusiast manager that was a cork-board made from the wine bottle corks. You can buy them, but there is something special about having one made for you or making one yourself. It;s a nice reminder of the celebratory moments the wine is associated with. You should try vodka. The bottles are more interesting. Nice post. Your creativity is cool. I have the same experience like U, But U r more creative than me.. I have several of bootle colection… The design is unique that I keep it in my glass wardrobe and some for flower vase. :) Tks for Ur idea. it’s really inspiring…. When I was your age, my college friends and I used to wedge a candle into the top and let the wax run down over the bottle. When one burned down, we put in another of a different color. 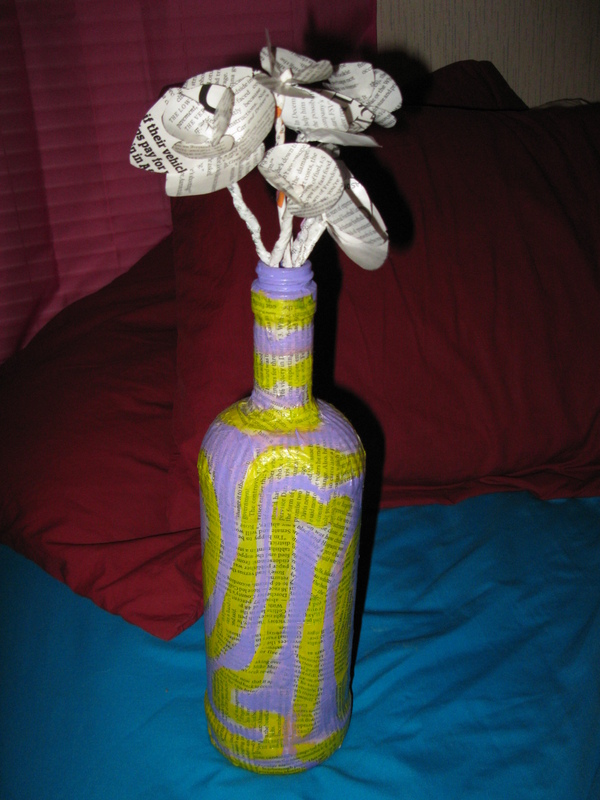 The bottle was a fat-bottomed Chianti bottle wrapped in raffia. Tacky, very tacky, but we thought it was cool. Now that I’m older, I put them in the recycle bin and let others do the recycling. Congratulations on coming up with a number of creative ideas! this is such a creative idea! and i love wine! I would just like to say THANK YOU to everyone for your suggestions and support! I’m new to the WordPress community and I have received such a warm welcome. So glad so many of you like these ideas and find them useful :) I’m eager to hear of more. cheers! Loving the vase idea. That’s fantastic! Also thought the dough roller was great. Thanks for sharing! My grandmother saved odd shaped bottles and filled them with colored water and put them in the window sills, so that idea resonates beautifully with me. She’s in heaven now but I still do that until this day; in fact, I still have and use several of her old bottles. Love nostalgia. Nice post. Look forward to more. i just bought gorgeous wine stoppers from venice and i plan to use my empty wine bottles as water bottles, kept cold in the fridge. love your other ideas as well. thank you! Thank you for tips and an excellent blog in general. Wine bottle corks can also make a nice airy veil. It is advisable to reserve several hundred wine bottle corks, though. You will also need durable enough wire, a strong needle, maybe some pliers and protective gloves. Do not forget eye protection! Reserve long enough wooden bar, which the strings of corks are to be attached. Depending on the amount of wine bottle corks and your desire you can make a dense or a bit less dense curtain. Multiple colors and shapes of different type wine bottle corks make the curtain lively and fascinating. Very creative ideas. Thinking out of the box. awesome! gotta try out the one for the fruit flies! 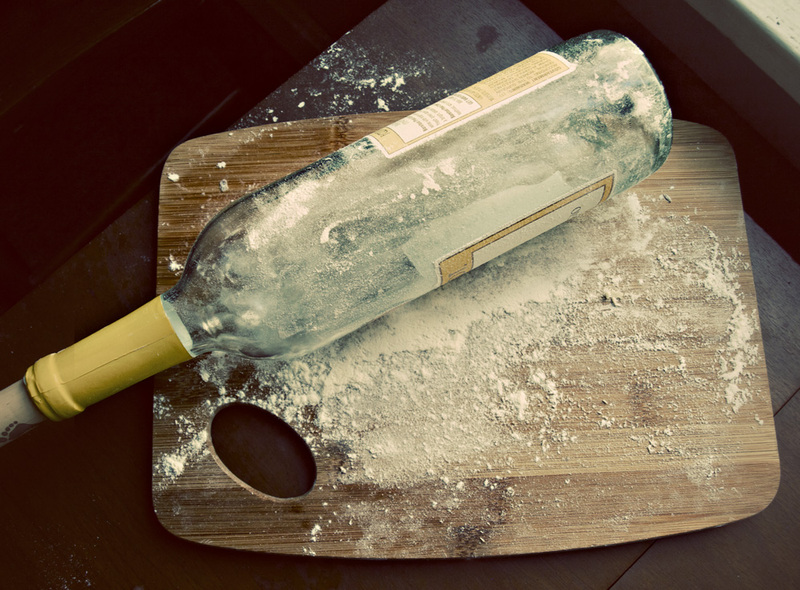 I remember on more than one occasion having to improvise for a rolling pin by using a wine bottle. Boyfriends at the time were not into fully equip kitchens. The quiche turned out just fine, all the same. Me and my friend always save our bottles of wine that we have at dinner when we go out together at restaurants! now we can actually do something with them! thanks! What a great excuse to drink wine! The narrow neck makes them just about right for watering plants. I don’t drink wine, but that’s what I do with the root beer bottles. Very enjoyable post and comments. Excellent ideas! I must try these with my red wine bottles! I’ve seen them turned upside down and pushed into the ground to edge flower beds. Very pretty! Very smart. I should start finding ways to reuse all of the things that I have been getting attached to. I collect loads of furniture so the book ends and flower vases wont work for me… But next time I get a nice bottle, I will use some great idea of use before I sadly junk it. Congrats on FP. In this economy, home recycling is incredible and really does brighten a home without the expenses. these are some really cute ideas for my left over wine bottles that i like! thank ya! Or cut off the bottoms and use them as candle covers or in a center piece. I use to be young and creative like you. Collecting wine bottles and ideas. They had a certain romance. Then I saw a collection of some 30 bottles that a friend had amassed on a breakfront and thought…frat house. UGH! I recycled every one of my bottles. Crate and Barrel sells lovely flower vases and an awesome marble rolling pin. 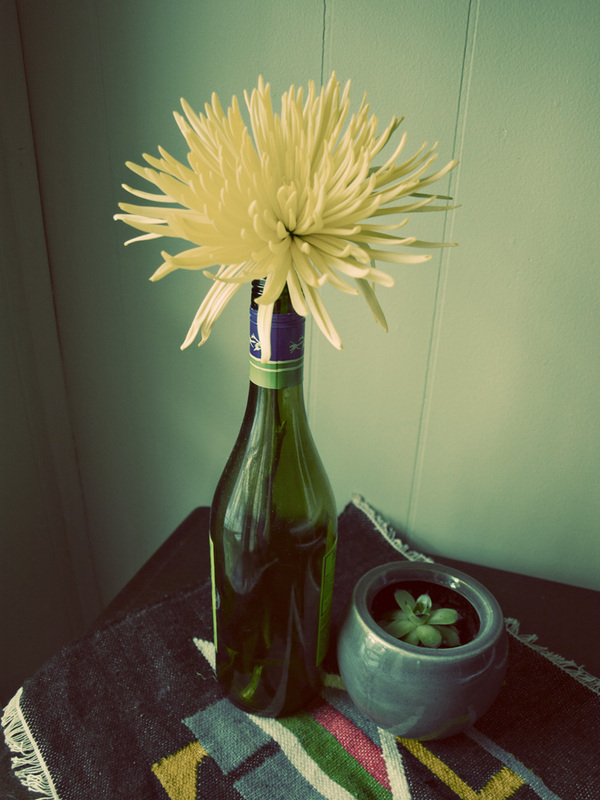 I paint my old wine bottles and then make matching paper flowers to sit in them. I have a beautiful blue Reisling bottle on my kitchen windowsill. I love the blue light that dances on the floor in the morning when the sun shines through it! My sister has a wine bottle “tree” in her landscaping and I have seen a trellis with wine bottles on it also. They and put bottom up on dowel rods that stick out of a post at an angle. Looks very pretty in the sun. Will be very neat with a vine growing over them! Good usage for them. Like it again !!! Check out my post for today !!! I’ve saved far too many wine bottles and used them to make garden borders: http://basementnotes.wordpress.com/2011/05/18/chard-spinach-celery-basil/. I don’t know if anyone has mentioned it, yet, but you can also use the soap-dispenser idea for an olive oil (or any other sort of liquid, really) dispenser. ahh i’m in love! what a wonderful idea! i’ll have to try that in my little garden. You can make fountains out of them, too. Very cool ideas. I have a few wine bottles laying around. Thank you for this post. I love the ideas upon the bottles of wine. being frugal as I am these ideas will come in very handy. My mom is making wine for my wedding with re-used bottles but I hadn’t thought about using the extras at vases, thanks! The moment I saw the title of your post in ‘Freshly Posted’ I smiled to myself. A while ago I saw the ‘The Princess and the Frog’ and I liked the colored glass bottles hanging on the tree. Now I know that they have spiritual purposes. But we also had empty wine bottles circling around the house. So one day I woke up with a decorating spirit and took the bottles, cleaned them and put them along our windows. I think most wine bottles have an inner beauty beyond that that which they originally contained! Love these ideas! We’re a non-profit that is starting a ‘Message in a Bottle’ Fundraising campaign…for a project to establish a Ethiopian wine industry focused on fighting poverty. But we were thinking of including a little insert on other creative things to do with the bottle after they receive it…so thanks, we may refer people to this list! that sounds wonderful! i’d be honored! thanks and good luck with your campaign.. that sounds like an amazing cause. Practically amazing! Recycling wine bottles is very environmental and so artistic. Wine bottle rolling pin works great! Thanks for the idea! I have bottles saved up to use as flower bed edging. Put them about halfway into the ground topside first. I also use them for DIY “aqua globes” in my flower pots and garden (beer bottles too). Fill it with water, dig a small hole near the base of the plant and stick it in. « Bait Car: Learning to Take the Good with the Bad. You are currently reading Practical Applications: DIY Guide to Repurposing Wine Bottles at brookelauren's finest.